The project is maintained by anonymous and autonomous people. Some with no (legal) income or papers or no national attachment. It would be nice to share a bit of solidarity if you like the projects and ideas we put in place. We work with very modest and very limited financial resources, mostly from visitors or other occupants of the zone, and especially with a lot of heart. We put our skills to use in sharing and maintaining tools and resources, in workshops and exchanges for radical (H)Activists and other rebels. Help us resist repression, fight back and attack all forms of oppression from all sides ! Kept at bay for years by the movement, a new attempt at eviction of the residents of the ZAD at Notre-Dame-des-Landes has begun. [english live ticker, FR, twitter] Starting at 3 a.m. today, the operation began deploying in all its brutality: Interminable lines of blue police vans, armored vehicles, tear gas, the first injuries and the first arrests. Gendarmes announced that reporters were strictly forbidden “throughout the operation” and blocked their access to the site. They declared that the press was prohibited from taking photos and that the media would have access only to images supplied by the Gendarmerie. The expulsions confirm the government’s pretense of re-establishing the rule of law while in fact grossly flouting the law. The Prefecture has not even granted the inhabitants of the ZAD access to the minimum guaranteed by the law on the right to housing, in this case the right to individual procedures and the right to contest an eviction decision. Yet the residents of most areas within the ZAD have identified themselves by name on several occasions over the past few years. The Prefecture’s outrageous duplicity is visible today in all its hypocrisy: After announcing it would seek a “serene and peaceful evolution of the situation” it sends 2,500 police/army to destroy residents’ homes. We are told that a selection will be made on the basis of categories that are pure fiction and have no bearing on anything but the needs of the repressive storytelling the government has locked itself into. There is no false division here between radicals on the one hand and farmers on the other; what exists are a number of different and intertwined ways of sharing this land. Contrary to what Gérard Collomb [Minister of Interior] claims, in fact no one has been individually legalized over the recent weeks at the expense of the others. The movement as a whole has proposed a framework for a collective agreement involving all residents and all their projects. But the government could not simply admit that the proposed airport was useless; they were bent on taking revenge against those who had forced the abandonment of the project. The land is dying, the most brutal forms of economic processes are atrophying our lives, and everywhere, people aspire to alternatives to that situation. On February 10 30,000 people had committed to supporting the future of the ZAD. But the government’s political message is very clear this morning: It will allow no possibility for spaces where alternative experiments can take place. 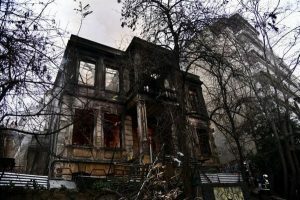 On January 9, 2013, 93 anarchists fight their way in against riot cops in and re-occupied Villa Amalias, after it was evicted on December 20th, 2012. 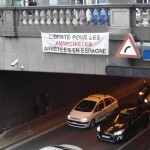 After more than 4 years, the trial against the 93 anarchists will start on March 28th. On December 2012 as part of a far-right delirium, the State targets Squats and proceeds to evict several of them in Greece. 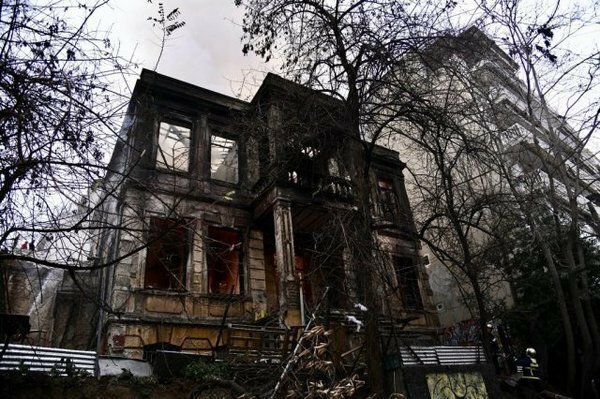 On 20 December 2012 the State evicts one of the historical and oldest squats in Athens (since 1991) named Villa Amalias. In the morning of 9 January 2013, 93 comrades moving collectively and decisively fight their way in against riot policemen that continue to guard the building and succeed to retake the grounds, sending a message of resistance and solidarity, against the onslaught of State and capitalist barbarism. After a few hours special police forces invade the building and arrest the 93 activists. 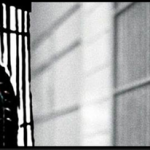 After more than 4 years, (a usual State and judicial tactic to keep activists’s lives “imprisoned” in perpetual waiting) on March 28, 2017, the 93 are being taken to trial for the reccupation of Villa Amalias, because they dared to disturb the “peace” during the regime’s war and because they remained unruly against the imposed state of emergency and the authoritarian rules, whilst they declare that ‘for the “crime” of fighting for a world of equality, solidarity and freedom they remain consciously “guilty”’. 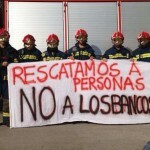 Spanish firefighters are refusing orders to participate in evictions because their duty is to “serve the public ” and intervene in “emergencies” and not to be “puppets of the bank or its servants in the government”. Firefighters in Galicia, Catalonia and the Madrid region have rejected any action that “contributes to inequalities and miseries suffered by the working class,” said the CCOO union.